The public discourse is going to get noisier and noisier in the next six weeks. So taking a cue from Bill Clinton's remark about the voters from last Friday, "They just want to think it through." His comment brought to mind the 1960 version of Inherit the Wind, a fictional protrayal of the 1925 Scopes trial, in which a young schoolteacher was prosecuted and convicted of teaching evolution. 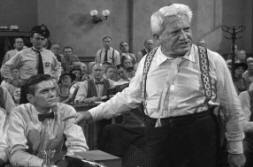 Spencer Tracy plays trial lawyer Henry Drummond (meant to portray Clarence Darrow, who represented John Scopes), who interrogates Fredric March, who plays Matthew Harrison Brady (meant to portray William Jennings Bryant) in their courtroom clash. At the end of a hot day in the courtroom, Tracy turns and points to his client and exclaims, "This man wishes to be accorded the same privilege as a sponge! He wishes to think!" I know that emotions (mine included) will run high as November 7 approaches. I'm excited about the prospects for Democrats to win control of the House and possibly the Senate. But between now and election day, I will do my best to be a blogger for those who want to think things through. "They just want to think it through." Maybe Time for a Change of Course?